The artists of the San Francisco Ballet brought the War Memorial Opera House to life on Sunday with the opening performance of the 2016 repertory year. What a fantastic start to the season! With three compositions about as different from each other as one could imagine, the afternoon was all about the breadth and scope that is twenty-first century ballet. Program one opened with Artistic Director Helgi Tomasson’s 7 for Eight, a stunning piece of choreography from 2004 and one of my personal favorites. Mathilde Froustey and Tiit Helimets stood center stage in a square pool of light for the ballet’s expositional movement. As Bach’s Baroque score sang through the air, their pas de deux was an equivalent picture of constant motion. Arabesques extended past the pointed foot, supported turns folded into inventive port de bras. Vanessa Zahorian and Gennadi Nedvigin continued that uninterrupted physical flow well into the second movement, though with a more forward whimsical feel. Zahorian’s series of diagonal posés providing a perfect example of this essence and quality. A charming, courtly trio followed with gorgeous and breezy multiple pirouettes by Taras Domitro, which then led into a more contemplative duet by Nedvigin and Lonnie Weeks. While the music in this fourth movement is weighty and minor, Tomasson’s choreography contrasted with a lightness and buoyancy. Domitro returned to the stage in a fifth movement solo, accompanied by the harpsichord. This was a pristine moment of specificity, clarity and exactness – the music and the movement together as one. As 7 For Eight reached its final sections, Froustey and Helimets reappeared with a development on their previous choreography. They ventured away from the center spot they had occupied at the beginning of the dance, and cycled through soaring jeté lifts, spinning dips and graceful falls. And while there is a joyous finale for the entire cast after this particular duet, it feels like the ballet should end with their final embrace. After the first intermission, the curtain rose and a video projection descended down the scrim – men in bowler hats falling to the earth just like the rain sounds in the accompanying score. The scrim disappeared to reveal a similarly costumed soloist (Davit Karapetyan) who shared an emotive, passionate movement phrase. Karapetyan was then joined by a group of men and women who had balloons placed in front of their faces. Quickly those circles of enclosed air flew away into the ether. This was the beginning of Magrittomania, Yuri Possokhov’s 2000 homage to artist René Magritte and the tenets of surrealism. An ensemble work for a lead couple, featured trio and a chorus of eight, Magrittomania is an immersive design experience – carefully stylized and at times, almost retro and nostalgic. In keeping with the attention to surrealist details and influences, the cast of curious characters flowed in and out of unpredictable architecture. And the atmosphere was filled with the peculiar – giant green apples, sheer face coverings, familiar classical melodies injected with bizarre sound effects. The only missing link was the costuming for the women. While the dress certainly fit with the overall vision of the piece, it didn’t read particularly well from the stage. 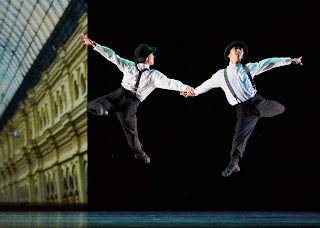 The standout performance in Magrittomania was given by the trio of Max Cauthorn, Esteban Hernandez and Wei Wang, all members of the corps de ballet. I wonder if San Francisco Ballet has ever considered adding another soloist tier to its company structure (second soloists or demi-soloists) because there are a number of dancers in the corps (including these three) who would be candidates for such a promotion. Program one closed with the North American premiere of William Forsythe’s Pas/Parts 2016, an updated iteration of a 1999 work originally made for the Paris Opéra Ballet. While I didn’t survey those around me, I think it’s fair to say that this particular piece received the most mixed reviews of the day. Some seemed to absolutely love it, while for others, it was clearly not their cup of tea. I fell somewhere in between. Structurally, Pas/Parts 2016 offered a contiguous collection of segments, in a variety of forms, set against a stark white-boxed stage. Many of the sequences were filled with strange and avant-garde choreography, like post-modernism and contemporary ballet had married in some kind of dream-like state. Others looked like they had old-school jazz dance influences, which had then been juxtaposed against traditional batterie. There were visually striking moments, like when the women raised a single arm to fifth, while staring intently into space. Carlo Di Lanno and Sofiane Sylve’s duet in the first third of the work was unexpected, yet intoxicating at the same time. And the final group sequences for the men and the women were choreographically intriguing, some parts danced in unison, some offset in canon. Having said that, the piece lagged in the middle, the soundscore was a little distracting at times and overall, it was just too long. But I was definitely drawn in by many of the dancers’ performances – individuality and charisma were abundant on the stage to be sure. Jennifer Stahl was the picture of precision. Joseph Walsh’s ability to transform himself from one physical state to another in the matter of seconds was astonishing. And James Sofranko was a force in this work, the freedom and flexibility in his upper torso truly remarkable.